Winter and white flowered plants go well together. Even in the snow these plants will dazzle and brighten the landscape in these chilly months. Hellebores put on a great show in winter. While they come in a rainbow of colors, look for white-flowered ones to make your garden sparkle. Paperbush (Edgeworthia chrysantha) is stunning both for its oddly shaped blooms and its exceptional fragrance that permeates the garden in the dead of winter. Winter honeysuckle (Lonicera fragrantissima) has clusters of flowers in creamy-white that bloom from late winter into early spring. An added bonus is its lemony smell. Sweetbox (Sarcococca x confusa) has the perfect mix of shiny evergreen leaves and small white fragrant blossoms that makes it a darling in the winter garden. Another relative is Sarcococca hookeriana var. humilis, an evergreen groundcover with small but very fragrant white flowers. False rue anemone (Isopyrum biternatum) should be grown in more Triangle gardens. This ephemeral wildflower performs even in the coldest of days. It starts its show in January followed by blooms of dainty white flowers in February. Camellias (Camellia japonica) are the sweethearts of the south and easy to grow here. Often called the rose of winter, look for flowers in white to make a spectacular winter statement. Clematis cirrhosa is a climbing clematis that blooms in winter. Just make sure to plant it where it has protection from winter wind. ‘Jingle Bells’ is a white flowered variety with a lemon-scent. This clematis will go dormant in summer so plant it with summer-blooming clematis to fill the space. 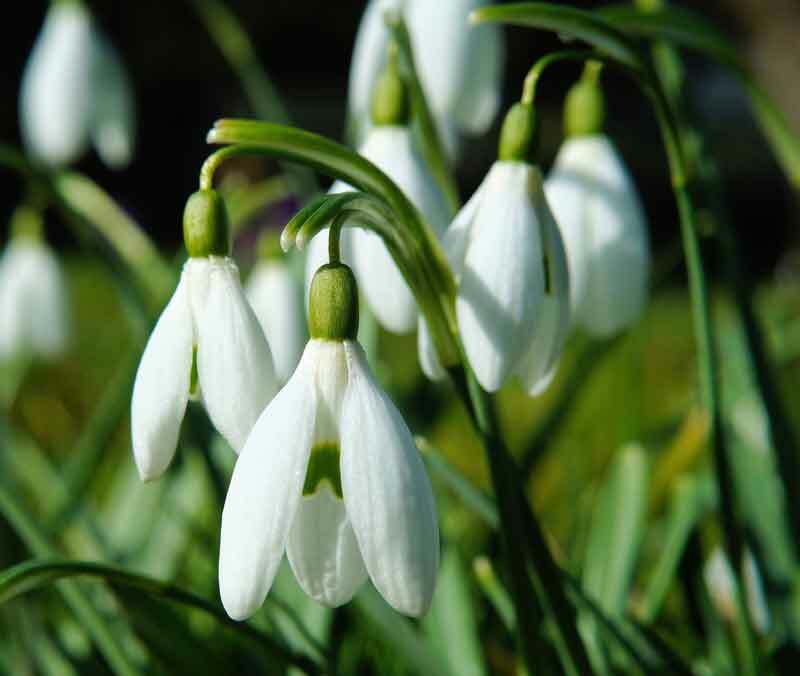 Snowdrops (Galanthus elwesii) are a sign in late winter that spring is on the way. Planted as bulbs in the fall, they multiply into drifts as the years go by, extending late winter flowers throughout the garden. White-flowering pansies added to your containers are reliable bloomers except in the worst days of winter. Don’t worry, they will recover when warmer days return.